1897 is the second full length album on 12k from Australian soundscapists Seaworthy. Primarily the recording project of Cameron Webb, Seaworthy have continued to develop their sound over the last eight years with move towards a greater emphasis on minimalism in their improvisation and composition of guitar, electronics and field recordings. In the winter of 2007, Webb commenced recording in and around a 100 year old decommissioned ammunitions bunker in Newington, Australia. Constructed in 1897 to store gunpowder, the bunkers were in use by the Australian navy until recently, including the Gulf War of the 1990s. In stark contrast to the cold dark interiors of the ammunitions bunkers, surrounding the building are extensive remnant wetland and forest environments that provide locally important habitats for a number of endangered and internationally protected wildlife. These areas are essentially off limits to the general public. 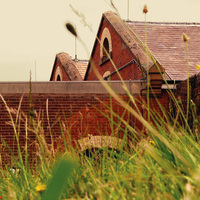 During a three month period as an ‘Artist in Residence’ with the Sydney Olympic Park Authoirity’s Arts Program, Webb undertook a series of improvisations, compositions and field recordings within the bunkers and surrounding natural environment. As well as pieces of looped guitar and electronics, installations of field recordings played back with the bunkers were also recorded, using the natural reverb of the large rooms as a way of processing the sounds of birds, insects and wind through trees. The large sandstone bunkers were infused with so much natural reverberation that even the gentlest footstep seemed to take on a life of its own. Over 6 hours of 4-track cassette, minidisk and computer recordings resulted from the sessions and the processing, assemblage and mixing of the tracks that make up 1897 took most of 2008 to complete. The process was made more difficult with the recording and post-production sessions punctuated by the birth of Webb’s first child. As a result, most of the post-production was completed under the haze of sleep deprivation and was a long, drawn out process. Unlike the warm pastoral sounds on Map in Hand (12k1040), 1897 is a starker, more melancholic album. Some tracks stripped back to a single guitar track while others feature a colder, abrasive approached to drone pieces. Generally more minimal compositions that reflect the emptiness of the bunkers and the eerie quiet that so often descends on the natural world within the depth of winter. Since the release of Map in Hand, Seaworthy have increasingly stepped out to perform live with a diverse range of artists including Philip Jeck, Christopher Willits, Birchville Cat Motel, ii, Love of Diagrams, Papa M, Rand and Holland, Tujiko Noriko, Adrian Klumpes and Because of Ghosts.